Home / Health A-Z / How To Get Rid of Sinus Infection Fast? How To Get Rid of Sinus Infection Fast? If you have ever suffered from a sinus infection you know how painful and debilitating this disease can be. This is why we decided to put together a detailed evidence based overview of medical and natural treatment options for sinus infection. How to cure sinus infection? 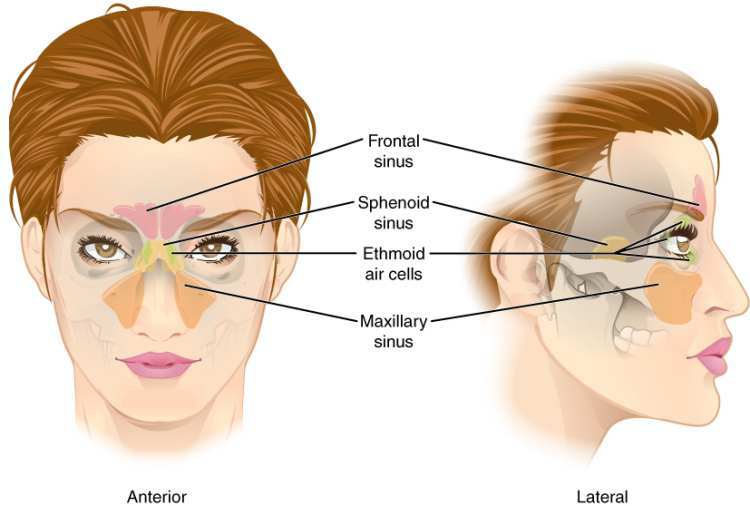 Sinuses are four major pairs of hollow air-filled spaces present in the human skull (1). These are linked to the space between the nostrils and the nasal passage at the back of your nose. Sinuses help in insulating the skull, reducing its weight, and allowing the voice to resonate within it. The sinus cavities provide defense against viruses and bacteria (germs). Sinus infection is a common condition in which the interior layer of the sinuses becomes inflamed. It is mostly caused by a viral infection and often resolves on its own within two or three weeks. Sinuses are small, air-filled spaces present behind our forehead and cheekbones. The mucus secreted by the sinuses usually drains into the nose through tiny channels. In a sinus infection, these channels become obstructed due to inflammation and swelling of sinus linings. Sinus infection is a widespread health problem. It affects 31 million people in the United States. Americans shell out more than $1 billion annually on the treatment of sinus infection. The doctor visits due to sinus infection are tallied at nearly six million every year and $150 million is spent on medications. Patients suffering from allergies, respiratory disorders and structural obstruction in the nose or sinuses, or individuals with weak immune systems are more vulnerable to sinus infection. A bad bout of flu or cold is often confused as sinus infection because many symptoms are the same, such as headache, facial pain, runny nose and nasal congestion. A sinus infection that develops close to the brain can be possibly fatal, if not treated. In some cases, it may extend to the brain. Normally sinuses have a lining of a thin stratum of mucus that traps germs, dust and other foreign particles in the air. Minuscule hair-like projections present in the sinuses move the mucus (and whatever is trapped in it) towards small openings that lead to the posterior part of the throat. From here, it moves down to the stomach. Thiscontinual process is a regular body function. Infection of sinus cavities obstructs the normal flow of mucus from the sinuses to the back of the throat. The small hair-like "sweepers" become clogged when infections or allergies cause tiny nasal tissues to swell. This swelling traps mucus in the sinuses. A sinus infection can trigger a headache or strain in the eyes, cheek area, and nose or on one side of the head. A person suffering from sinus infection may also have a cough, fever, sore throat, smelly breath, and nasal congestion with thick nasal secretions. It is a commonly encountered medical condition classified as acute sinus infection which has a sudden onset or chronic sinus infection which is long term. From the medical point of view sinus infections can be divided into four main groups - recurrent, chronic, subacute and acute sinusitis (2). Acute sinus infection or acute rhinosinusitis causes the spaces around your nasal passages (sinuses) to swell up and become inflamed. This hinders drainage and leads to the accumulation of mucus. If you are suffering from acute sinusitis, you might find it difficult to breathe through your nose. The area around your eyes and face will feel swollen, and you might have excruciating facial pain or a throbbing headache. It is usually caused by the common cold. Most cases of acute sinusitis resolve by themselves but may require medical attention if bacterial infection develops. Acute sinusitis generally lasts less than four weeks. Sinusitis lasting between 4 to 8 weeks is usually called subacute. If 4 or more flares of acute sinusitis occur in a year, it is called a recurrent sinusitis. Medicines are usually effective against acute sinusitis. Successful treatment counters harm done to the mucous lining of the sinuses and nearby bone of the skull. Usually, home remedies are sufficient to treat acute sinusitis. However, persistent sinus infection can lead to serious symptoms and other complications. Sinus infection that lasts more than eight weeks despite medical treatment is called chronic sinusitis. Chronic sinus infection or chronic sinusitis is a widespread condition in which the sinus cavities around nasal passages become inflamed and swollen — for a minimum of eight weeks, despite treatment attempts. This condition is also known as chronic rhinosinusitis and it interferes with drainage and causes mucus to build up. If you have chronic sinusitis, it may be difficult to breathe through your nose. Chronic sinusitis is usually caused by an infection, but it can also be a result of growths in the sinus cavities. These structural blockades include nasal polyps or a deviated nasal septum. Chronic sinusitis usually affects young and middle-aged adults, but children are also affected by it. Chronic or recurring sinus infection lasts longer than eight weeks or occurs more than three times a year, with symptoms usually lasting more than twenty days. Most cases of chronic sinus infection occur after an acute sinusitis infection. The following factors may cause an acute sinus infection to become chronic. In most cases, acute sinus infection takes place due to a cold or flu-like illness. Common cold and flu are due to microbes called viruses which may spread to the sinuses. In some cases, bacteria attach on to an infection that began with a virus. This can lead to a bacterial sinus infection which can make exacerbate the infection, make it last longer and may cause more damage or harm to the lining of the sinus. In some cases, infection spreads to the cheekbone (maxillary) sinus from a tooth affected by infection. Nasal allergy may cause swelling of the tissues on the inside lining of the nose and obstruct the sinus drainage channels. This makes the sinus cavities more vulnerable to infection. A compromised or poor immune system - for example in patients with HIV, patients on chemotherapy, etc. A poor immune system makes you more vulnerable to any infection. Fungal infections are rarely a cause of sinusitis and occur most commonly in individuals with a poor immune system. Inflammatory disorders for example Wegener's granulomatosis or sarcoidosis. Pregnancy makes women more prone to nasal rhinitis. Drugs or sniffing substances that irritate the lining of the nose (for example, cocaine). It may be acute sinusitis if you have some of these symptoms accompanied by thick, green, or yellow nasal discharge. Your doctor will check your symptoms and perform a thorough physical examination. He may press and feel your sinuses for tenderness, and tap your teeth to check if you have an inflamed paranasal sinus. You may also require other tests. Allergic rhinitis is a medical condition in which inner lining of nose becomes inflamed (6). It is triggered by an allergen, such as dust, pollen, mould or flakes of skin from certain animals. Symptoms of allergic rhinitis may appear within minutes or hours after you breathe in an allergen. The symptoms may last for several days. Allergic pink eye with watery, itchy eyes. Sneezing over and over again, especially after waking up in the morning. Irritation or a tickle in your throat or coughing caused by postnasal drip. Congestion. A stuffy nose, possibly with sniffing. This is the most commonly observed symptom in children. You have to breathe through your mouth because your nose is blocked. Constantly rubbing your nose. Mostly kids do this. Sensitivity of eyes to light. Mood swings and fatigue. Feeling grumpy. A long-lasting, persistent (chronic) cough. Pain or discomfort in your face. Dark patches or circles under your eyes (allergic shiners). Other causes of sinus infection with symptoms similar to allergic rhinitis include upper respiratory infections (URIs), inflammation, nasal defects and non allergic rhinitis which is not triggered by allergens. Nasal polyps are soft, painless, benign growths that appear on the inside lining of your nasal passages or sinuses (7). They hang down like grapes or teardrops. They are caused by chronic inflammation due to asthma, allergies, recurring infections, drug sensitivity or some immune disorders. Small nasal polyps may not cause any symptoms. Bump or zit like bigger growths or clusters of nasal polyps can obstruct your nasal passages or lead to breathing problems, a loss of sense of smell, and recurring persistent infections. Nasal polyps can affect all age groups, but they're more common in adults. Medicines can often shrink or eliminate nasal polyps, but surgery is sometimes required to get rid of them. Even after successful treatment, nasal polyps often return. Nasal polyps are linked with inflammation of the lining of your nasal passages and sinuses that lasts more than eight weeks (chronic rhinosinusitis, also known as chronic sinusitis). Nasal polyps themselves are soft and painless, so if they're small you may not be aware you have them. Multiple growths or a large polyp may block your nasal passages and sinuses and cause symptoms to appear. Decreased or loss of sense of smell. Pain in your upper teeth. A sense of pressure over your forehead and face. Abrupt worsening of your symptoms. Double vision, reduced vision or limited ability to move your eyes. Increased swelling around your eyes. Extremely severe headache accompanied by high fever or inability to tip your head forward. Fix drainage of mucus and alleviate swelling and inflammation in the sinuses. Provide relief for pain and pressure. Decrease possibility of formation of scar tissue, and prevent permanent damage to the tissues lining the nose and sinuses. For sinus infection caused by viral infection, no antibiotic treatment is needed. Also, antibiotics are usually not prescribed for mild to moderate sinusitis (8, 12). Generally prescribed medicines include pain and fever medications (for example acetaminophen Tylenol), decongestants and mucolytics (drugs that dissolve or breakdown mucus such as, guaifenesin) (9, 10). Bacterial infection of the sinuses manifests symptoms such as facial pain and nasal discharge resembling pus. These symptoms persist for more than a week and are not responsive to OTC nasal medications. Even though amoxicillin (Amoxil) is a good first line antibiotic option for an uncomplicated acute sinus infection, many doctors opt for amoxicillin-clavulanate (Augmentin) as the first-choice drug for treatment of a bacterial sinus infection as it is effective against most of the species and strains of bacteria that cause the infection (12, 13). If a patient does not exhibit signs of improvement after five days of treatment after Amoxil use, the therapy may be exchanged to one of the above mentioned drugs or amoxicillin-clavulanate (Augmentin). Usually, an effective antibiotic treatment needs to last for about ten to fourteen days. But sometimes medicine might need to be given for a week longer. Some antibiotics are now known to also reduce inflammation, besides their anti bacterial activity. It is sprayed into the nose to clear nasal passages and stuffiness (14). These topical nasal sprays prevent and treat inflammation of sinus cavities (15). Popular examples include fluticasone (Flonase), triamcinolone (Nasacort AQ),beclomethasone (Beconase AQ) , mometasone (Nasonex) and budesonide (Rhinocort Aqua). Systemic corticosteroids are taken as pills or injection and enter the blood, which distributes them throughout the body. These drugs are used to for relief from inflammation during severe sinus infection, especially if you also have developed nasal polyps (16). Examples include prednisone and methylprednisolone. Oral corticosteroids can cause dangerous side effects when used long term, so they're used for treatment of severe symptoms and only when prescribed by your physician. Decongestants can be purchased as over-the-counter (OTC) and prescription liquids, nasal sprays and tablets. Commonly used OTC oral decongestants include Sudafed and Actifed. An example of an OTC nasal spray is oxymetazoline (Afrin). These medications are not taken for more than a few days; otherwise they can lead to the return of more severe congestion or rebound congestion. While they provide an immediate relief, there is no evidence that they really work as an actual treatment option (17). Sinus pain infection is treated by over the counter analgesics such as Tylenol, aspirin or ibuprofen (Advil, Motrin IB). Due the risk of Reye's syndrome — a potentially fatal disease — never give aspirin to anyone younger than age 18 unless it is prescribed by your doctor. Some of these medicines can make chronic sinus infection worse, so be sure to check with your doctor before starting use of any pain reliever. If allergies are the cause behind your sinus infection, allergy shots (immunotherapy) that help decrease the body's reaction to specific allergens may help allay the condition (18, 19). In cases are unresponsive to pharmacological treatment or medication, endoscopic sinus surgery is a treatment option. In this procedure, the doctor uses a thin, flexible tube with an attached light, called an endoscope, to probe your sinus cavities (20). Then, depending on the source of infection or blockade, the doctor may use various instruments to remove tissue or a polyp that's causing obstruction. Enlarging a narrow sinus opening also may be an option to improve drainage. There are many home treatment options available providing relief from sinus infection. However there is no scientific evidence that these home remedies really work so use them wisely and only with prior consent of your doctor. Almost all of the traditional healing systems of the world have recognized cayenne peppers as a potent medicine, and on a good basis: cayenne is chock full of a component known as capsaicin that is useful in treatment of many medical conditions, including sinus-related problems. For example, a randomized, double-blind study published in Annals of Allergy, Asthma & Immunology in July 2010 showed that capsaicin could help relieve the headaches, nasal congestion, and sinus pains and pressures connected with rhinitis. Take a minuscule amount of organic cayenne powder and inhale it up each nostril. Then, allow the discharge to flow into a tissue or sink. If you cannot bear the unpleasant burning sensation that is produced from snorting cayenne, you can dilute cayenne powder with some water, dab the mixture to an ear swab and administer it that way. Adding some cayenne pepper to your meals or using it as a supplement can also help accelerate the treatment process. Apple cider vinegar has been used since ancient times in traditional medicine for its medicinal properties and may be an effective treatment for mild sinus infections. It is a natural bactericidal, antiviral, antifungal and anti-inflammatory agent that can eliminate the harmful microorganisms that cause the infection (21). Secondly, it helps the body keep up a healthy alkaline pH level, which helps to break up mucus and discourages the spread of disease. Lastly, apple cider vinegar has been proven to give our immune system a boost, meaning it can help prevent sinus infections from developing in the first place. 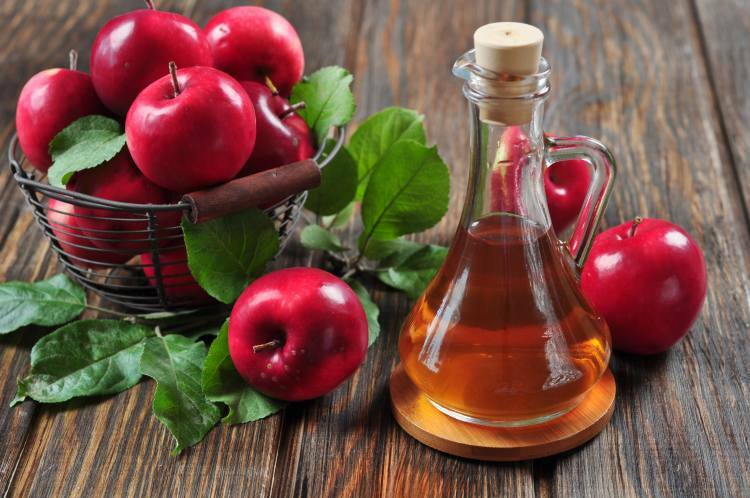 There are various ways to use apple cider vinegar to treat a sinus infection. The easiest way is to mix one tablespoon of apple cider vinegar into a cup of warm water and drink the mixture regularly until the infection subsides. For a more effective approach, mix two tablespoons of apple cider vinegar into a cup of warm water and snort one tablespoon of the mixture up each nostril. Each time, allow the sinus discharge to flow down your throat and then spit it out. Garlic is often known as nature’s antibiotic due to its powerful medicinal properties (22). Almost all of garlic’s major health benefits stem from its large allicin content, an organic sulfur compound that is widely regarded for preventing and treating disease due to its significant antibacterial, antifungal, antiviral and antioxidant properties. Its high allicin content is what makes garlic so great at clearing up sinus infection. Garlic is much too strong to be snorted. Instead, it’s a good idea to incorporate some chopped or crushed garlic into your diet. You can also make an inhaler out of garlic by immersing some large garlic cloves in water for about a few minutes, crushing them into a paste and then inhaling the fragrance until the sinuses are decongested. You can clean the inside of your nose in a sinus infection using either a home-made salt water solution or a solution made with packets of ingredients purchased from a pharmacy. To prepare the solution at home, mix a teaspoon of salt and a spoon of bicarbonate of soda into a pot of boiled water that has been left to cool. Wash and dry your hands properly. Stand over the sink and pour a small amount of the solution into the cup of your palm. Take up the solution into one nostril at a time. Repeat these steps until your nose feels less stuffy. You should make a fresh solution each day. Don't re-use a day old solution. Another great home remedy for treating sinus infection is to add a few drops of eucalyptus oil to a pot or pan of boiling, hot water, drape a towel over your head, close your eyes and inhale steam deeply for instant relief. Eucalyptus oil has anti-microbial and anti-fungal properties and helps reduce the inflammation and swelling of mucous membranes. It also increases ciliary beat frequency (e.g. "self-cleaning power of mucous membrane in respiratory tract), which may be helpful in dealing with sinus infection (23). Ginger turmeric tea is a great all natural, home remedy for a bad cold or sinus infection. Ginger has antibiotic medicinal properties and is a home remedy for many ailments (24). The active substance in turmeric is called curcumin. Joining turmeric and black pepper helps to boost the curcumin in turmeric manifold, increasing its effectiveness. Lemon adds a boost of vitamin C.
Combine all ingredients in a glass or cup and stir. Let the tea stand for a few minutes, stir again and sip. Prepare ginger tea as described above. Let it cool to a point that it's still hot, but not scalding hot if you dip your finger in. Dip a hand towel into the hot tea and squeeze out the excess liquid. Lie back in a comfortable position and close your eyes. Place the tea-soaked hand towel over your face and inhale in the steam. Repeat this step four to five times, or until the tea is too cool to use. The tea will be hot, so let it cool for a few moments before you drink it. Ginger has a spicy, bitter, pungent flavor that can be neutralized by the addition of sweetener. If the tea is too strong for your taste add more water next time. Add a sweetener such as sugar or honey. Honey is preferable as it helps soothe sore throat. Turmeric is a root that has antiviral, antibiotic and anti-inflammatory properties that help clear sinus infections and congestion (25). It has an active compound known as curcumin that helps heal the inflammation and swelling in the sinus cavity and clears the airways. Dissolve a pinch of turmeric powder in a glass of warm water. Gargle with it a few times a day and repeat this process till infection clears up. Drinking a glass of hot milk mixed with one teaspoon of turmeric powder and a little honey also helps in relieving sinus infection. Drink it every day for about one week or until the infection clears. Blend two pieces of turmeric root (two inches), juice extracted from one lemon, one tablespoon of honey, a pinch of cayenne pepper, one banana and a half cup of water. Use this beverage daily to treat sinus infection. Onion acts as an excellent decongestant to open up your obstructed sinuses. Additionally, it contains sulfur compounds that ward off bacteria and fungi. Chop up an onion into small pieces and place the chunks in a pot of water. Allow it to boil for about five minutes, and then inhale the vapors for a few minutes. After that, strain the liquid and drink it. Repeat these steps few times a day for about a week or until the infection clears. Drinking plenty of fluids should be a top priority when dealing with a sinus infection. Staying sufficiently hydrated helps your white blood cells to battle disease causing germs more efficiently, which gives a much needed boost to your immune system. Increasing fluid intake can also help thin out your mucus, allowing it to drain more freely as inflammation decreases. The quality of the fluids you choose is as significant as the quantity - sugar rich beverages such as bottled orange juice and sweet natural fruit juices can get in the way of the ability of white blood cells to kill bacteria. Instead, go for clear broth, soup, tea or plain water. Warm fluids can be especially helpful in facilitating mucus flow. In flu season, chicken soup is very comforting. It clears the sinuses and gives your immune system a boost (26). A whole chicken, broken down into eight to ten pieces (remove skin and leave bone in). Six cups of chicken broth (homemade is preferable but you can also purchase canned broth from market). Two large cloves of garlic, chopped. Half a cup chopped onion. Two celery stalks, peeled, thinly sliced. 6 ounces dried wide egg noodles or one cup uncooked long-grain rice. Half a cup finely chopped fresh parsley. Two tablespoons fresh thyme or two teaspoons dried thyme. Pat chicken parts dry. Season chicken pieces with salt and pepper. Brown chicken pieces in an oven with a teaspoon of canola oil over medium-high heat for about eight minutes, turning once. Pour in chicken broth to the pot. Bring to boil. Lower heat. Cover partially and simmer until chicken is cooked properly, should take about 20 minutes. Transfer chicken to a large bowl using tongs. Allow chicken and broth to cool. Discard bones from chicken. Shred or pull apart chicken meat into bite-sized pieces and put aside. Ladle fat off top of chicken broth. Return broth to stove. Add in chopped onion, carrots, celery, and thyme. Simmer until vegetables are cooked, should take about 8 minutes. (You can prepare a day ahead, but be sure to store broth and meat separately in the fridge). Stir in noodles, parsley, and shredded chicken. Simmer until noodles are soft, about 5 minutes. If you use rice, simmer until the rice is tender. Season soup to taste with salt and pepper. Pour into soup bowls, and garnish it with parsley if you want. Fenugreek seeds about two to three teaspoons. Add fenugreek seeds to the water. Boil the water till half of its initial quantity is left. Strain and sip this tea slowly. Take this fenugreek tea several times a day till you get relief from your sinus infection. Do not use any medicine without consulting with your doctor first. Even if you feel better, do not stop using the antibiotic your doctor has prescribed. You should continue taking the antibiotic exactly according to your doctor’s instructions. If you do not complete the course, your body might develop antibiotic resistance making the infection more difficult to treat. Antibiotics are not as potent if not taken on scheduled time. As drugs remain in the body over a period of time, each dose should be taken according to the doctor's instructions. Cold and flu and resultant sinus infection are often caused by viruses and not bacteria. Ensure that you are not taking antibiotics for a viral sinus infection. Do not use decongestants for a long period of time. Handle cayenne peppers carefully as they may cause burning sensation on skin and eyes. How to differentiate between chronic and acute sinus infection? If a sinus infection lasts for more than eight weeks or returns again and again visit your doctor to check for chronic sinus infection. Throbbing pain in facial area. Pain spreading from the bridge of the nose to the lower eyelid. Headache that is not cured by an over-the-counter pain medicine, such as acetaminophen or ibuprofen. Fever spiking to 101°F or higher. Mucus discharge from nose that starts out clear and later becomes thick and discolored (yellow or green). Flu symptoms that last longer than ten days or get worse after the first week. Mild or throbbing pain in the face that lasts longer than a month, fluctuates, or has not been checked by a doctor. Not noticing any improvement within 5 to 7 days after starting antibiotics for your sinus infection. Increase consumption of fluids as it helps in thinning of mucus and clears infection. Apply moist heat using a towel dipped in hot water or a gel pack to your face for five to ten minutes, several times a day. Inhale warm, moist air from a hot bath, a steam shower or a pot filled with hot water. Stay away from extremely cool, dry air. Consider using a humidifier to enhance the moisture in the air in your home. Use saltwater nasal washes to help keep the nasal passages unobstructed and to improve drainage of mucus and wash out bacteria. You can buy saline nose drops or sprays from a medical store or make your own saline solution at home. If you make a salt solution at home, use filtered water or water that has been boiled and then cooled. Patients who have postnasal drip might also find it helpful to gargle frequently with warm salt water. This can help prevent a sore throat that often accompanies sinus infection. If you need to blow your nose, blow it gently. Forceful blowing may propel thick mucus back into your sinuses and block them. Keep both nostrils open while blowing your nose. Avoid consumption of alcohol. It causes swelling and inflammation of the tissues lining the nose and sinuses. Medicines used to treat sinus infection include antibiotics, antihistamines for allergy, corticosteroids, etc. Home remedies include ginger tea, turmeric, cayenne pepper, apple cider vinegar, etc.